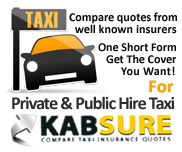 PrivateHireInsurance.net is a website that details relevant information on private hire insurance for taxi vehicles operating in the United Kingdom. When you visit PrivateHireInsurance.net some information is captured by our statistics scripts that tell who referred you to our site (Like Google or Twitter), what country you are in, how long you stayed for and what pages you viewed. To do this Cookies are used. We may use this information to better understand our target market and improve our marketing. Unless otherwise stated, we do not capture or keep any personal information. Any information held by PrivateHireInsurance.net is for accounting and insurance quotation purposes only. If you decide to get in touch with PrivateHireInsurance.net in any way (like through our contact page) then we reserve the right to retain your contact details and e-mail you at a later date. We will never pass on your details unless requested to do so by Scottish Law or where you have requested an insurance quotation. PrivateHireInsurance.net or any associated parties is not responsible for the content of external links or comments made public on this website.